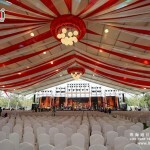 How to find one professional marquee tent manfuacturer at the lower cost? 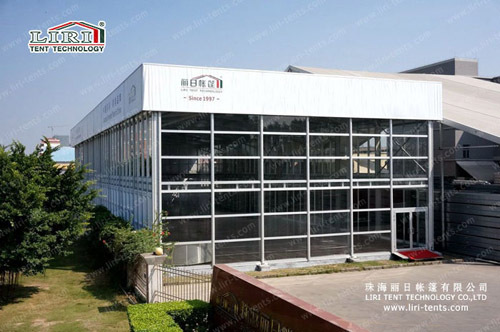 The Liri Tent is the first and largest aluminum tent manfuacturer in China with rich experience since 1997. Now our tents have been exported to over 120 countries or regions around the world and got the good reputation from our clients all around the world. The aluminum framework of our tents are manfuactured by hard pressed extruded aluminum alloy, the roof cover and sidewalls are made of flame retardant, water proof, UV resistant, double PVC coated polyester textile. The high qualtiy material we use for our tents is the strong quality guarantee of our tents for last many years. 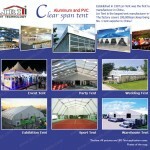 The clear span width of our tents is from 3m to 80m, length is unlimited and customized. 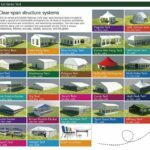 It’s available for the A shape tent, dome tent, suqare pagoda tent, high peak tent, curve tent, arcum tent, polygon roof tent, multi sides hexagonal tent, Octagonal tent and more. We have lots of mature tent design for your choose according to your favor and offer the best space solutions for your event or party. hard pressed extruded aluminium 6061/T6(15HW) which can last more than 20 years. Q: Can you print our logos on event Tent For Sale? Yes.Customized logos can be print on the tent fabric according to your requirements. Q: Is that factory price? Yes.We assure you all prices are based on factory. Q: Does your tent be able to install repeatedly? Our tents can be assembled and dismantled and repeatedly with small transportation size.The lifespan of aluminium framework can reach 15-20 years,and 5-8 years for PVC fabrics depending on different conditions of usage. A full range documents including structural drawings,packing list,installation manual and relative certificates can be provided.Moreover,customs declaration is provided.We provide one-stop service for you. Q: What size tent is necessary for your special event? A person must first determine tent usage. If a tent is being used for dining purposes and round tables are being used allow 10-12 square feet per person. If banquet style tables are being used allow 8-10 square feet per person.If the purpose is for cocktail service allow five to six square feet per person. 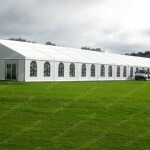 Contact us for all your specific questions and more information on tent types. Yes.Our tent product has passed the engineering tests and gained the America And Australia structural engineering certificates. Besides, the PVC fabric used for roof covers and sidewalls has passed the fire tests and gained the flame retardant certificates issued by America, Australia, New Zealand, and Britain. Q: Is your tent strong and stable enough? How about the wind loading? Yes.The main frameworks (upright support and roof beam) are manufactured with high impact extruded anodized aluminum (6061/T6) so our tent structure is safe and strong and can resist wind up to 100 km/hr. Q: How long is the warranty period?